The England international has been in stunning form for Dortmund over the course of the current campaign, and he has contributed eight goals and a further 13 assists in the Bundesliga alone. Such progress has caught the attention of United, who are said to be preparing a £100m plus bid, but Watzke has stressed that the attacker won't be sold at any price. "We will not sell him, that is fact. 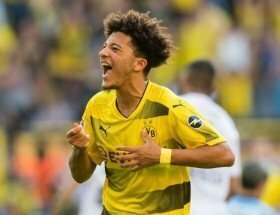 It is clearly discussed with every person who is involved that Jadon plays in the next season for BVB. His progress is brilliant," he told Eurosport Germany. United are keen on pursuing a right-sided attacker during the summer transfer window and they have also been linked with PSV's Hirving Lozano and Chelsea's Callum Hudson-Odoi in recent weeks.